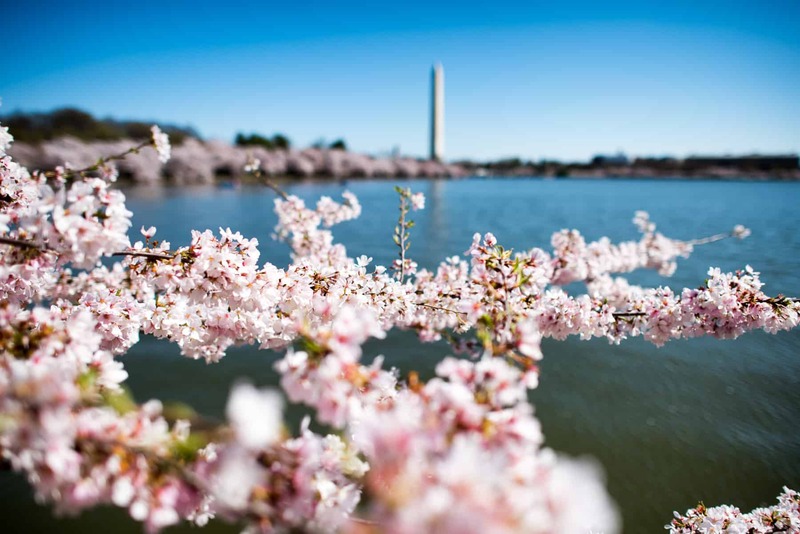 The cherry blossoms are still going strong, and with the sun finally coming out it's a gorgeous spring day at the Tidal Basin. The rain and breeze has knocked some of the fragile petals off, but it's still only a relatively small number of the total. It's now four days after the peak bloom day, and the cherry blossoms are looking great. Many of them are turning pink, and there are the occasional green leaves coming through. But overall it bodes well for the chances of there still being something to see on the weekend as long as they make it through Friday's rain. Later this week. By Tuesday, the rain had already started to knock a large number of petals off. There are still many, many more to go, so the trees were still looking great, but it's an indication of how fragile they are. And they're only going to become more fragile each day. As of Wednesday, they're still looking great. Weekend of April 1-2. Given how they're looking Wednesday, I have a little more confidence that there'll be something to see on the coming weekend. Yesterday's rain and today's breeze did knock some petals off, but mostly they're looking strong. They are getting more fragile each day, of course, and a thunderstorm of rain could dramatically change things. The problem, though, is that the petals are now getting more and more fragile, and rain or wind is going to knock them off. As of right now, the weather forecast is calling for light rain all day Friday. That's not ideal (although it is better than heavy rain). I posted a separate update on them a few days ago. A classical quintet has set up to play under the cherry blossoms near the Japanese Pagoda. Fishing for crappie (yes, that's the real name of the type of fish). There are some green leaves coming through on some trees. You can see some of the petals coming down in a gust of wind. Thank you very much for your day to day cherry blossom updates. I am undecided to come to witness the blooms this holiday weekend, but upon seeing the flowers' radiance, they are alluring! We have to pack up and will hit the road to DC tomorrow. I'll be posting another update shortly. There will be at least some out this weekend, but it's still only a tiny proportion of the total. I can not thank-you enough for doing this regular Cherry Blossom watch update. This website has been a key factor on me planning when to head to the city to photograph the Blossoms. Fantastic work and Thank-You! !